Context: Thyroid dysfunction is a major public health problem among the Nepalese population. The average prevalence of thyroid disorder was 30% seen in different parts of Nepal. It is important to detect these disorders at the preclinical stage and manage them accordingly. Aims: This study aimed to assess the clinical spectrum and outcome of patients with hyperthyrdoism in BP Koirala Institute of Health Sciences, a tertiary care teaching hospital of Nepal. Settings and Design: This is a prospective observational study. Subjects and Methods: All adult hyperthyroid patients presenting to the Department of Internal Medicine were enrolled for 1 year and evaluated for clinical spectrum and outcome after treatment with antithyroid drugs. Statistical Analysis Used: Descriptive statistics such as frequencies, mean, standard deviation, and proportion for quantitative variable were calculated and association was established using Chi-square test with P values. P < 0.05 was considered statistically significant. Results: Among sixty patients of hyperthyroidism enrolled in the study, common clinical manifestation was palpitations (92.7%), tremulousness, and heat intolerance (70.1%). Similarly, most common clinical sign was warm, moist skin (89.1%), followed by tremors (72.7%). After treatment with antithyroid drugs, 60% became euthyroid within 6 weeks. Conclusions: The most common symptoms of hyperthyroidism were palpitation. Majority of patients improved with antithyroid drugs within 6 weeks of treatment. Thyroid disorder is defined as the abnormal thyroid stimulating hormone (TSH) with normal or abnormal thyroid hormones, free tri-iodothyronine, and free tetra-iodothyronine. The thyroid disorders may be due to congenital factors, a genetic predisposition, inadequate levels of dietary iodine intake, pregnancy, radiotherapy, viral infections, surgery, and underlying diseases such as infiltrative disorders or even autoimmunity. Thyroid dysfunction is a major public health problem among the Nepalese population and also among the local population in eastern Nepal. The majority of thyroid disorders were seen in 21–40 years' age groups, which is the productive age group of the country. The average prevalence is 30% seen in different parts of results in Nepal. Hyperthyroidism causes atrial fibrillation, ophthalmopathies, and various other metabolic syndromes. Hence, it is a paramount importance to detect these disorders at the preclinical stage and manage them accordingly., Limited study has been done of this type to our knowledge and it will help in better screening of this disease in future. For the clinical outcomes which symptoms to monitor and what thyroid parameters to assay in future can be guided by this study. As this study was done at a tertiary care center, population from different strata visit this hospital so including such patient reflect the overall population clinical profile of hyperthyroid patients. Since no study has been done regarding clinical profile and outcome of hyperthyroidism in eastern Nepal, we planned to do this in our hospital. The study included sixty patients presented to BP Koirala Institute of Health Sciences (BPKIHS) during the period of 1 year (March 14, 2015–April 15, 2016). All adult patients admitted and presented with hyperthyroidism and meeting inclusion and exclusion criteria were included in the study. Informed and written consent was taken before enrollment in the study. Any acutely ill patients, or sick euthyroid. Then, sociodemographic characteristics and other relevant data were collected from face-to-face interview and paper pencil questionnaire eliciting data in age, gender, occupation, address, ethnicity, and marital status. Detailed clinical examination, thyroid function test (TFT) (free thyroxine3 [FT3], FT4, and TSH) and relevant investigation was done (complete blood count, liver function test, fasting lipid profile, random blood sugar, electrocardiography (ECG), and transthoracic echocardiography). Ultrasonography neck, fine needle aspiration cytology (FNAC), and radioiodine uptake scan (RAIU) were done when needed. The laboratory evaluation of thyroid functions was done by estimation of serum T3 and T4, which was done by competitive chemiluminescence immunofluorescence assay (CLIA) method and immunoenzymatic colorimetric method (enzyme-linked immunosorbent assay [ELISA]). TSH was done by sandwich CLIA and immunoenzymatic colorimetric method (ELISA). Standard laboratory value of BPKIHS Biochemistry lab was considered while interpreting the laboratory report on thyroid parameters. Initial enrollment of the patients was done and after enrollment, patients were started on antithyroid drugs (ATDs) as per the American Thyroid Association guidelines, i.e., titration regimen and block–replace regimen, and was followed up after 6 weeks and patients were re-evaluated for clinical symptoms and signs. TFT was re-evaluated and was followed up till the end of the study (i.e., for 1 year). The starting dose of ATDs was tablet propylthiouracil 100 mg PO OD or tablet carbimazole 10 mg PO TDS. Moreover, tablet propanolol 10–40 mg PO TDS or QID was gradually reduced as clinical features of hyperthyroidism improved. Dose was titrated based on unbound T4 levels and TSH levels. Daily maintenance doses of ATD in titration regimen were 2.5–10 mg of carbimazole and 50–100 mg of propylthiouracil. High dose of ATD was given combined with levothyroxine supplementation to avoid drug-induced hypothyroidism. Initial dose of ATD was held constant and dose of levothyroxine was adjusted to maintain unbound T4 level or TSH level. Data were entered in Microsoft excel 2003- microsoft corp., New York, USA. Consistency, errors, and illegal values were checked after verifying with original document/source document. Data analysis was performed using Statistical Package for the Social Sciences (SPSS) software for Windows version 16.0 (IBM Corp., in Armonk, NY). Descriptive statistics such as frequencies, mean, standard deviation, and proportion for quantitative variable were calculated and association was established using Chi-square test with P values. P < 0.05 was considered statistically significant. In the present study, a total of sixty patients aged above 18 years were included in the period of 1 year from September 2015 to September 2016. Out of the sixty patients, five were lost to follow-up for various reasons. The diagnosis of hyperthyroidism was made on the basis of symptoms and signs of hyperthyroidism and the serum FT3, FT4, and TSH levels. All newly diagnosed or existing cases of hyperthyroidism which were symptomatic at current presentation were included in the study. In our study, females (76.4%) were more than males (23.6%) with a male: female ratio of 3:1. The most common age group was 21–30 years with predominant Hindu religion (69.1%) [Table 3]. Palpitations was most common clinical manifestation (92.7%), followed by tremulousness and heat intolerance (70.1%), irritability (34.5%), diarrhea (27.2%), and thyroid swelling (20%) [Table 4]. Warm, moist skin was the most common physical examination findings (89.1%), followed by tremors (72.7%), tachycardia (43.6%), goiter (18.2%), hypertension (14.5%), opthalmopathy (12.7%), and proptosis (10.9%) [Table 5]. 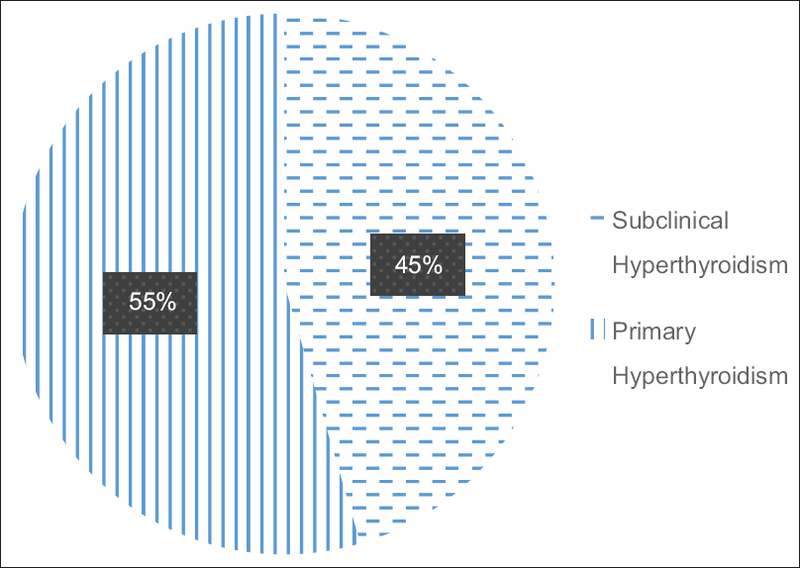 Subclinical hyperthyroidism was more common (55%) than primary hyperthyroidism (45%) [Figure 1]. 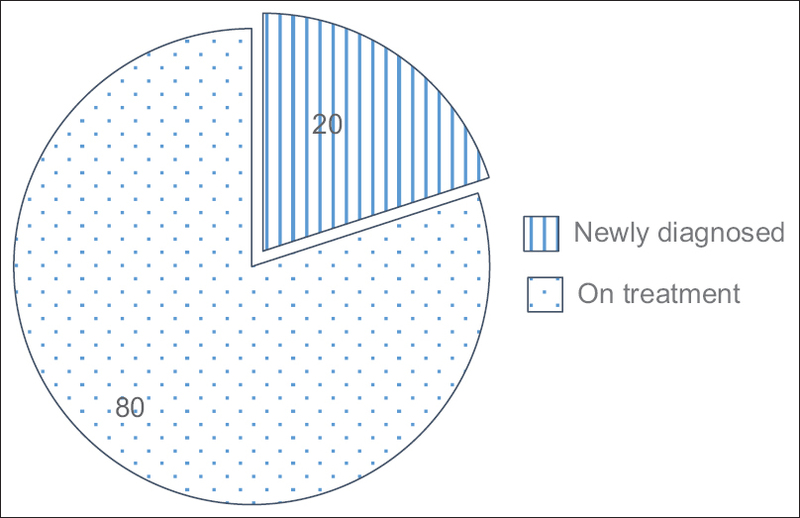 Among them, 20% were newly diagnosed cases and 80% were previously diagnosed cases on treatment [Figure 2]. According to [Table 6], lipid profile pattern was as follows: total cholesterol of 103 ± 33.1422 mg/dL, serum triglyceride of 106.43 ± 35.4722 mg/dL, serum very low-density lipoprotein (VLDL) of 72.08 ± 14.9022 mg/dL, serum LDL of 81.45 ± 15.4922 mg/dL, and serum high-density lipoprotein (HDL) of 43.32 ± 4.80 mg/dL. Similarly, total cholesterol was 106 ± 31, 101 ± 36, 100 ± 31, and 104 ± 37 mg/dL; serum triglyceride was 117.62 ± 49.08, 95.24 ± 21.85, 100.08 ± 32.4, and 100.9 ± 31.22 mg/dL; serum VLDL was 73.31 ± 12.9, 70.86 ± 16.91, 71.64 ± 16.03, and 71.27 ± 16.2 mg/dL; serum LDL was 84.54 ± 12.41, 78.36 ± 18.57, 79.16 ± 11.25, and 80.37 ± 21.42 mg/dL; and serum HDL was 42.62 ± 5.37, 44.05 ± 4.23, 43.84 ± 3.01, and 43.6 ± 5.53 mg/dL in subgroup population of males, females, subclinical hyperthyroidism, and primary hyperthyroidism, respectively. 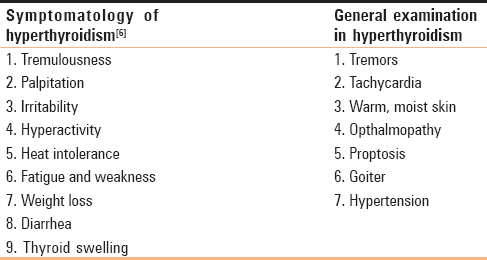 As shown in [Table 7], the most common ECG abnormality in hyperthyroid patients found were sinus tachycardia (38.2%), followed by atrial fibrillation and left bundle branch block (1.8%). As shown in [Table 8], mean TSH level before treatment was 0.16 ± 0.83 which was increased after treatment to 1.92 ± 1.31, which was statistically insignificant (P = 0.664, paired “t-” test). Similarly, mean FT3 and mean FT4 levels before treatment were 4.89 ± 4.52 and 15.81 ± 12.94, respectively, which was increased to 3.27 ± 2.36 and 7.86 ± 6.56 after treatment which was statistically significant (P < 0.001, for FT3 and FT4, paired “t-” test). According to [Figure 3], patients of hyperthyroidism were treated with tablet carbimazole, tablet propanol, and TFT was repeated after 6 weeks. Outcome of treatment was most of the patients became euthyroid (60%), remained hyperthyroid (31%), and became hypothyroid (9%). Thyroid dysfunction is a major public health problem among the Nepalese population. Hyperthyroidism causes atrial fibrillation, opthalmopathies, and various other metabolic syndromes. Hence, it is a paramount importance to detect these disorders at the preclinical stage and manage them accordingly. In the present study, male: female ratio was 1:3, which is similar to a study by Dhadke and Dhadk (1:4). Similar to their study, hyperthyroidism was more common in young females but common age group in our study was 21–50 years (67.3%) unlike 31–40 years (30%). Out of 55 thyroid patients, palpitations was the most common symptom (92.7%). Out of other manifestation of hyperthyroidism, heat intolerance and tremulousness were the most common followed by irritability, diarrhea, and thyroid swelling in descending order. These findings were consistent with Natarajan et al. while tremulousness was the most common symptom followed by palpitation in Dhadke and Dhadk study. This difference might be due to subjective variation of symptomatology. Similarly, out of various clinical findings, warm moist skin was the most common manifestation followed by tremors and hypertension, whereas tremors was the most common sign followed by tachycardia and hypertension in Dhadke and Dhadkstudy. Subclinical hyperthyroidism was more common (55%) than primary hyperthyroidism (45%); 20% were newly diagnosed cases and 80% were previously diagnosed cases on treatment. In the present study, total cholesterol (mean ± standard deviation) was 103 ± 33.14 mg/dL, serum triglyceride was 106.43 ± 35.47 mg/dL, serum VLDL was 72.08 ± 14.90 mg/dL, serum LDL was 81.45 ± 15.49 mg/dL, and serum HDL was 43.32 ± 4.80 mg/dL, which were within normal limits, whereas there was significant increase in the mean concentration of total cholesterol (confidence interval [CI]: 268.83–289.79) and triglycerides (CI: 154.81–182.05) in cases of hypothyroidism in study done by Mittal. Similarly, Raju et al. found abnormal lipid profile in 73.17% of cases. Another observation in this study was most common abnormality in ECG finding was sinus tachycardia 21 (38.2%). This finding was consistent with Dhadke and Dhadk (9 [25.7%]); 32 (58.2%) patients had normal ECG. Atrial fibrillation and left bundle branch block was less common in 1.8%. In the present study, 55 patients were treated with tablet carbimazole and tablet propanol, and TFT was repeated after 6 weeks. Mean TSH level before treatment was 0.16 ± 0.83 which was increased after treatment to 1.92 ± 1.31, which was statistically insignificant (P = 0.664, paired “t-” test). Similarly, mean FT3 and mean FT4 levels before treatment was 4.89 ± 4.52 and 15.81 ± 12.94, respectively, which was increased to 3.27 ± 2.36 and 7.86 ± 6.56, which was statistically significant (P < 0.001 for FT3 and FT4, paired t-test). Insignificant value of TSH elevation might be due to assessment after shorter duration of treatment. Another observation in this study was that outcome after 6 weeks of treatment with ATDs was euthyroid (60%), remained hyperthyroid (31%), and hypothyroid (9%). In a similar study, outcome of Graves' disease after ATD treatment, done in Iran by Shahbazian et al. 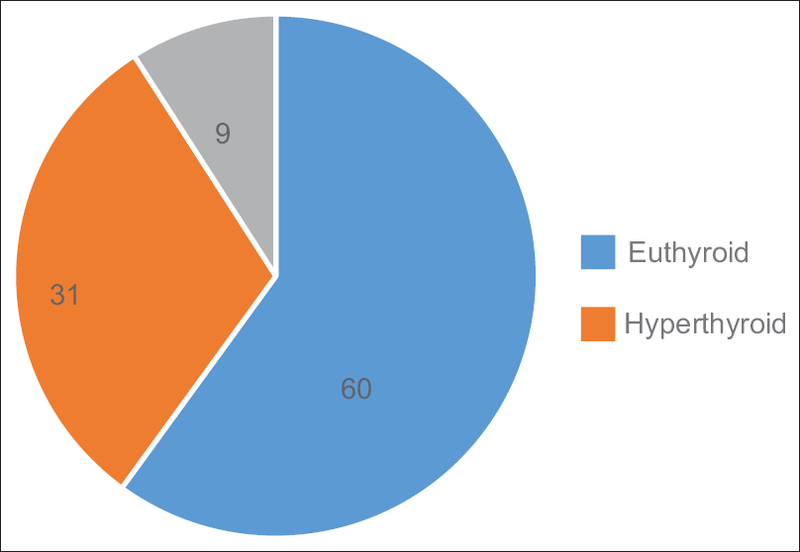 showed euthyroid (39%), remained hyperthyroid (53%), and hypothyroid (6%). These differences in results might be due to longer duration of follow-up (31 ± 16 months). Further, study with larger sample size needs to be done in a larger multicentric approach to establish the above findings. There is no control group, so the result findings may have biases. Dose standardization of ATD was not done, so individual variation in treatment may exist. Etiology of hyperthyroidism was not assessed. Hyperthyroidism is more common, especially in females, in the age group of 31–40 years. Early diagnosis, prompt treatment, and regular follow-up with TFTs, accordingly change in treatment regimen and compliance to treatment have significant role in thyroid disorders and their prognosis. We would like to thank our statistician Mr. Dharani Dhar Baral for his support and help. Brownlie BE, Wells JE. The epidemiology of thyrotoxicosis in New Zealand incidence and geographical distribution in north Canterbury. Clin Endocrinol (Oxf) 1990;33:249-59. Baral N, Lamsal M, Koner BC. 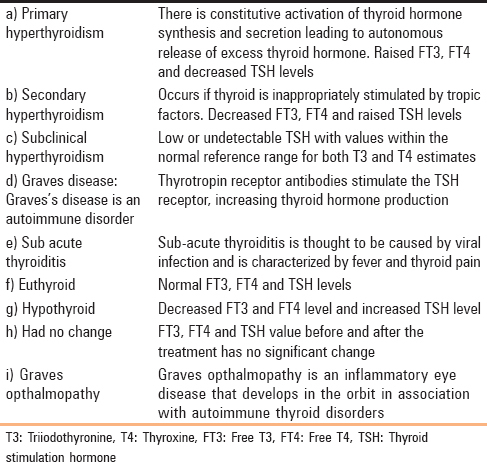 Thyroid dysfunction in Eastern Nepal. Southeast Asian J Trop Med Public Health 2002;33:638-41. Yadav NK, Thanpari C. Assessment of thyroid disorder in far western part of Nepal: A Hospital Based Study. Bangladesh J Med Sci 2012;11: 303-6. Chaudhari RK, Gelal B, Brodie DA, Baral N. Thyroid function and urinary iodine status in primary school age children of the hills and the plains of Eastern Nepal. Indian Pediatr 2012;4:332-3. Tayal D, Goswami B. Prevalence of thyroid disorders in patients visiting a tertiary care center in a New Delhi: A three-year study. Asian J Med Sci 2012;3:15-23. Bahn RS. Hyperthyroidism and other causes of Thyrotoxicosis: Management guidelines of the ATA/AACE. Endocr Pract 2011;17:e4-45. Longo DL, Fauci AS, Kasper DL, Hauser SL, Jameson J, Loscalzo J. eds. Harrison's Principles of Internal Medicine, 18th ed. New York, NY: McGraw-Hill; 2012. Dhadke SV, Dhadk VN. Clinical Profile of Thyroid Disorders. Int J Curr Res 2014;6:8484-8. Raju D, Soni S, Chaurasia A, Baghel PK, Jatav OP, Jain MK. Study of Clinical Profile of Hypothyroidism. APICON 2008. Shahbazian H, Saiedinia S, Aleali AM. Outcome of Graves' disease after Anti-thyroid Drug Treatment in South West of Iran. Pak J Med Sci 2012;28:445-449.